Sit and stand strollers or tandem strollers are ones that come with a seat in the front and a standing platform and a small bench seat in the back. This is ideal for your infant and your older kid who wants to ride along with the baby casually. These strollers are usually not very heavy and tend to be narrow. You can easily have one of these in and out of your car. Kids who do not like to be strapped onto a stroller and are somewhat independent – but want an option to hop on something when tired will love these strollers. 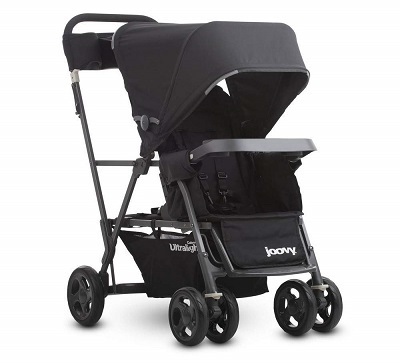 The Joovy Caboose model is one of the best sit stand strollers that you can purchase. Lightweight, compact, and easy-to-maneuver, this stroller comes loaded with features. Weighing only 22 lbs, this stroller has a parent organizer, a sturdy and large sun canopy, a removable child tray, and a car seat adapter. You no longer need to worry about traveling with this stroller, as it is car seat compatible. From Baby Jogger and Cybex to Recaro and Mountain Buggy, this stroller is compatible with most car seats. 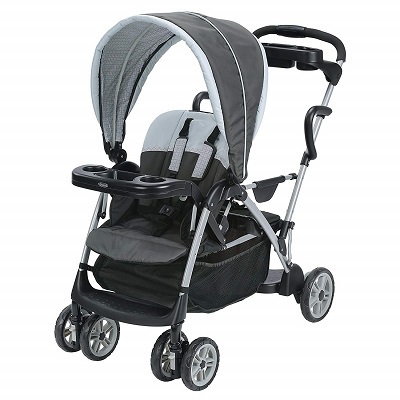 It is one of the lightest strollers in the market. It comes with innumerable features like a parent console, a rear canopy for the older child and a large canopy for the infant. The folder size of the stroller is long but it still fits into most trunks, and that includes cars like Chevy Malibu and Toyota Prius. It comes with a rear parking brake for added security. Some people complain that the car seat adapter is not too secure as it is just a holder to which the seat is strapped onto. What will you Like this product? 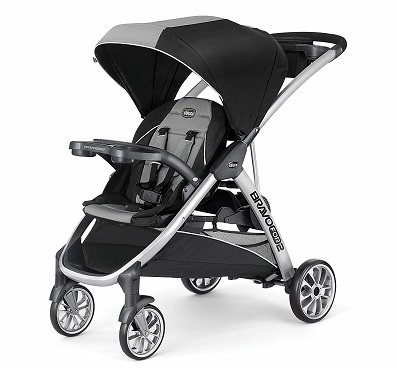 The latest model has a canopy option for the rear seat – something you do not find in most tandem strollers. You can also purchase a rear seat if your children do not have much of an age gap. Designed to hold two children up to 50 lbs, this stand and sit stroller is one of the most affordable options in the market. Whether you have an infant and a toddler or two toddlers, this stroller is just what you need to give them quick rides in the city. Graco is a well-known brand and is the best choice when you are looking for budget-friendly options. The front seat reclines to become completely flat so that your tiny one can sleep while you and your toddler explore the world. This stroller comes with a lot of storage options like a basket, a child tray, and a parent tray. It folds and latches easily as well. With a weight of 27 lbs and a number of safety certifications, this is a great choice for all parents of two. The best feature of this stroller is that the padded bench seat at the back comes with a harness. It is one of the best choices for people looking for an affordable option. It comes with a lot of storage options. Its front seat reclines completely to become flat so that the baby can sleep comfortably. It is compatible with only a few car seats. It is not a good choice for bumpy terrains. This double stroller will accommodate both your children and is a very affordable option. It comes with a lot of features and is designed to keep your kids comfortable and safe. The Chicco sit and stand stroller is another amazing choice. It is easy to push and ensures a smooth ride for the little ones. It offers a lot of room for storage and comes with a zippered pocket. The parent tray has a storage compartment and two cup holders. The large storage basket offers both front and rear access. The stroller is easy to fold, and one hand is all that you need for this purpose. The wheels simply roll back into each other, and you do not need to use the other hand to balance the stroller. It comes with a sturdy handle too. The main seat features a canopy, a 5-point harness, and a detachable child tray while the back seat has a 3-point harness. It is a lightweight and compact design. It offers plenty of storage options. Its one-hand fold mechanism makes it easy to fold and store the stroller. It offers smooth maneuverability of both the passengers in every configuration. The cup holders on the parent tray are not deep enough. It is compatible only with Chicco car seats. The front seat does not recline completely. This Chicco stroller is easy to use and comes with many storage options, making this a great choice for parents who travel a lot with their kids. A great choice for busy parents—parents who always have a lot of errands to run outside the house. It is lightweight, compact, and maneuvers really well. Both the seats are padded and ensure ultimate comfort for your kids. The secure harness keeps your children safe. The stroller comes with so many storage options that you will no longer need a baby essential bag. You can fit everything you will need for a stroll in the stroller itself. The swivel wheels are flexible and turn 360-degrees easily without you having to make them do it. The front seat is adjustable, and your baby can comfortably sit, lean, or sleep on it. The stroller is easy to clean and maintain. If you are looking for sit and stand strollers with car seat, then Baby Trend is a brand you can choose. Many of its models come with car seats. It is lightweight, compact when folded, durable, and sturdy. Its padded seats ensure ultimate comfort to the kids. It has plenty of storage options. Its Five-point harness keeps the kids safe. The handlebar cannot be adjusted. This stroller offers ultimate comfort and convenience for both kids. It offers the perfect blend of quality and affordability and is a great choice for families with two kids. 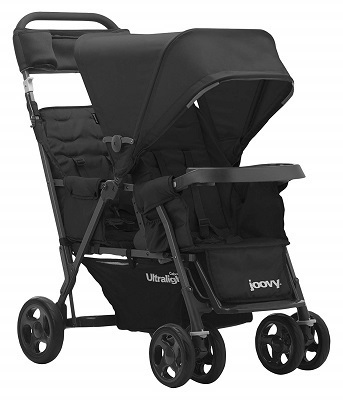 Featuring a strong aluminum frame, the Joovy Caboose Ultralight Too Sit and Stand stroller weighs 4 lbs less than its regular counterpart. With a weight capacity of 90 lbs, this stroller is an ideal choice for newborns as well as toddlers. It comes with a rear seat, a bench seat, and a standing platform. The bench seat with 3-way reclining options makes it easy for your little one to fall asleep on it. It has a compact size and fits easily through doors. This stroller comes with a rear seat unlike the model mentioned on top. It functions as a full forward-facing seat for your older child. The 4-wheel suspension design ensures a smooth ride for your kids. The stroller comes with a lot of storage options and a large canopy to protect your child from natural elements like the sun and wind. It is lightweight, compact, and easy to fold. It comes with a universal car seat adapter. It features many storage options. It has a rear seat for the older child to sit on and enjoy rides. It has a huge canopy with a rear extension for added comfort. If the front seat is reclined completely, the older child will not be able to sit on the rear seat. A lightweight and compact model that ensures a lot of comfort for both your children. It comes with a rain cover (not included) that covers both the seats and is easy to install. The last in the list is another one from the brand Graco. It comes with a number of seating arrangements and a lot of storage options as well. It easily folds and stands on its own. The dependable brakes and 5-point safety harness ensures complete safety to your kids. The large canopies are designed to provide both your kids with sufficient cover. The swiveling front wheels make it easy to push and maneuver the stroller. You can easily remove the seat and cushion for cleaning. An easy one-hand mechanism makes it easy to store the stroller when not in use. It comes with many storage trays and a large basket. It has large detachable canopies. It has as many as twelve seating configurations. It has an auto-lock system and 5-point harness security. The stroller is long and bulky. In spite of its long and bulky design, this Graco stroller is easy to fold and carry. You will love this stroller if you travel a lot with your two kids. 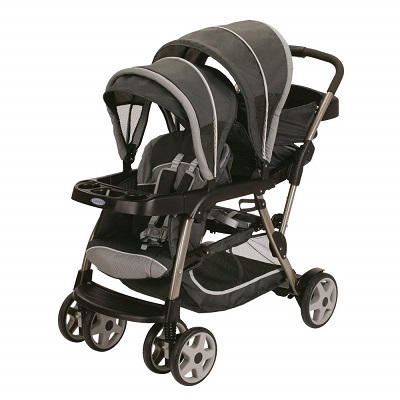 These are some of the best choices you have as far as sit and stand strollers are concerned. 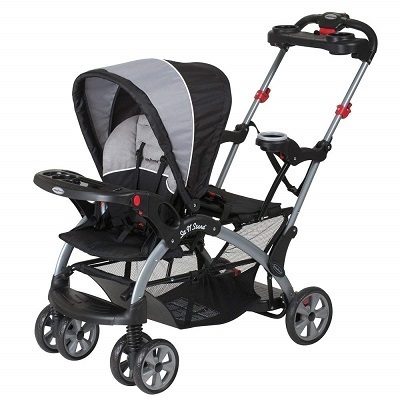 Sit and stand jogging strollers are generally not available as they are lightweight and narrow. All of these products are available on Amazon.com and have received great reviews from users. Your final choice depends on what exactly you are looking for and of course, your budget. Needless to say, choosing one from the above list will not disappoint you.